In April, I invited one and all to participate in a simple survey to see how they are actually using the UML on projects. Is it really mainstreamed? Is it still in the adoption phase? Or is it in decline? The survey is now closed. Thanks to those who participated. Here are the results. 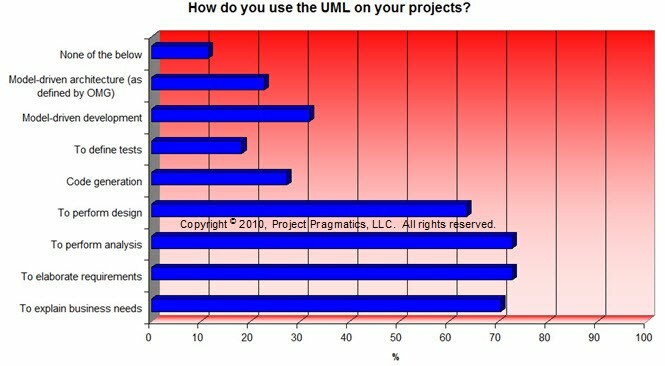 The results indicate that the use of UML is very strong in the early part of the project lifecycle. But once design is elaborated enough, it seems that’s it…on to code. These results seem to support the results of the first question, with use case and class diagrams being heavily used, followed by activity diagrams. I find it interesting that sequence diagrams are used only slightly more than state machine diagrams! State machine diagrams were used lightly in the past, specifically by those who build things that are time / state critical (medical devices, aerospace, etc.). Maybe their increasing popularity is tied to the renewed interest in system engineering that I am seeing in the marketplace. 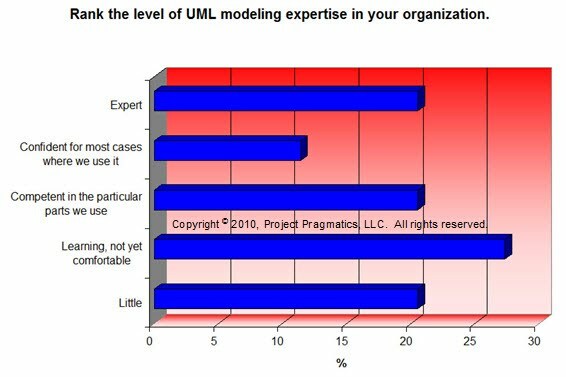 Last but not least, I asked people to rank their organization’s UML expertise. (See results in Figure 3). 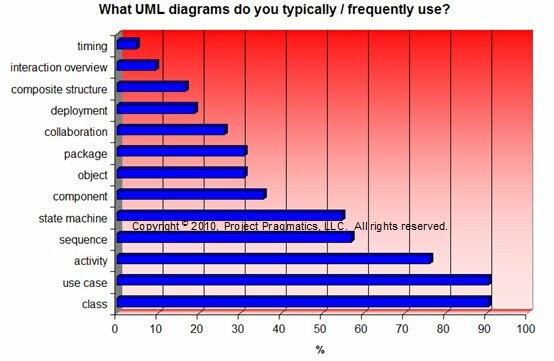 I find it very interesting that after all these years, with over 3000 UML books having been written, all the webinars, conferences, and so forth, that nearly half of the people still know little or are still learning about the UML. So what do you conclude from these results? Copyright 2009-2010, Project Pragmatics, LLC. All rights reserved.